﻿ Cycling Tours in Provence| Hosted Holidays| A Typical Day. WHAT A TYPICAL DAY LOOKS LIKE ON OUR PROVENCE BIKE TRIPS. Here are examples of 2 days' Provence cycling tour for the 2 extremes of cyclists (those whose interests are more Leisure & Sight Seeing than cycling, and those whose focus is more on the Sporty cycling side and the miles). Remember most of us are somewhere in between these two groups. Of course these bike tour itineraries are not written in stone, they are just an idea of what a couple of your days riding could look like - it's up to you. We will of course point you in the right direction with our local biking knowledge, so you can make the most of your Provence bike tours. 1 - A Provence cycling holiday with a small amount of bike time & with more of an accent on Tourism. Day 1 example includes: The pool, a ride to Gordes village for lunch & then onto some wine tasting, dinner at the Farmhouse. 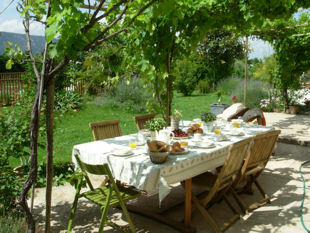 9am - Start the day with a nice French breakfast buffet under the vines. 9.45am - An hour in the sun lounging by the pool & lavender reading that book. 11am - On the bike for the breathtaking route to the hill village of Gordes. 45 mins on quiet back roads, through the vines. Take a stop at the ancient "Village des Bories" and visit the stone buildings that Provence is famous for. 12.30pm - 15 minutes on the bike to Gordes with its breathtaking views. 1pm - A leisurely lunch in one of the many village restaurants. 2.30pm - Time for a walk around the beautiful Provencal village of Gordes. A village with the entirety of its houses made from stone, take in the renaissance chateau & art galleries, the beautiful church, its many small and winding stone clad ruelles, and its restaurants and cafés by the stone fountain (as seen in the Ridley Scott film A Good Year!!). 4pm - Back on bike for 45 mins & down the hill & on the country lanes to one of the numerous Vineyards for some wine tasting. 6pm - Back to the farmhouse B&B for a freshen up and relax before dinner. 7pm - Join us for a drink and 3 course, home cooked dinner under the vines. Total bike time for the day (approx) : 1h 30 to 2 hours. Day 2 example includes: The Lavender Museum, a ride to Fontaine de Vaucluse & Isle sur la Sorgue for lunch, car ride to Avignon & dinner. 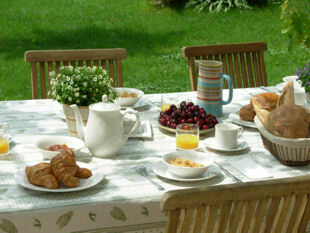 9am - Start the day with a nice French breakfast buffet under the vines. Then a 5 min walk into Coustellet for a visit of the Lavender museum, see the whole process & go to the shop. 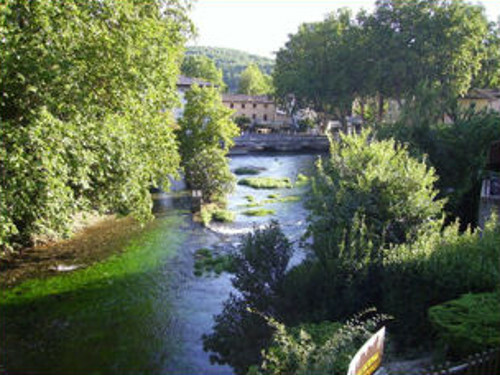 11am - 45 min scenic trip to Fontaine de Vaucluse - walk along the crystal clear Sorgue river, then up to the famous water source, have a drink at a cafe on the riversedge, by the old bridge and take in the atmosphere. 12.30pm - 20 mins along the flat to the town of Isle Sur la Sorgue (known as "Venice of Provence"), take in its many water ways & its dozens of authentic antique shops. Then a relaxing lunch at one of the numerous, recommended riverside restaurants. 2pm - 40 mins on the bike on the flat through the orchards back to the Farmhouse for a swim. 3.30pm - In the car for the easy 30 min journey to Avignon. 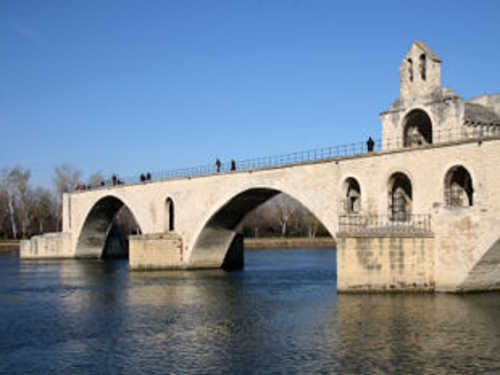 Visit the walled city with its Pope's Palace (UNESCO site), Pont d'Avignon and many interesting streets, museums & boutiques. 7pm - Drinks & dinner at one of Avignon's many excellent bars & restaurants. Total bike time for the day (approx) : 1h 45 to 2h 30 hours. Day 1 example includes: A 5 to 6hr ride in the beautiful hills beyond Gordes and into the Luberon Valley, back to the pool and Dinner at the farmhouse. 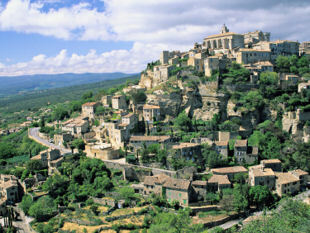 10am - On the bike, and up the Tour de France way to the most famous Luberon village of all - Gordes. Take a breather, take in the view... Continue up into the quiet, beautiful hills, crossing the canyons and on to St Saturnin. 1pm - Lunch stop at the great little bistro in St Saturnin. 2.30pm - On to Villars, then through the beautiful ochre mined landscape countryside to Roussillon, classified as one of "France's most beautiful villages". 4pm - Quick drink on the vilage square, then off through the beautiful hills. 5.30pm - Back to the Bed and Breakfast for a freshen up, pool and a relax before dinner. 7.00pm - Join us for a drink and a 3 course, home cooked dinner under the vines. Then I'm guessing bed early after all that! Total bike time for the day (approx) : 5 to 6 hours. Day 2 example: Drive to and ride up Mont Ventoux, Lunch on the mountain, Visit Goult Village, Local Restaurant for Dinner. 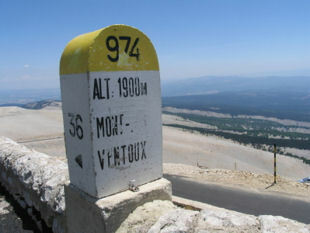 10am - In the car for the 50 minute drive to the foot of the cycling Mecca that is Mont Ventoux!! 11am - Get you time card punched at the Tourist Office and off you go. 12.30pm - You should be approaching the last and hardest section. 6kms @ 10% non stop + the wind = pretty tough. Then the fun part, the 30 min descent back to your start point. 3.30pm - Back in the car and towards the farmhouse via the lavender fields. 4.15pm - Stop off at Goult, a pretty village off the tourist circuit topped by its Windmill and Chateau. A sign-posted walk takes you from the mill through the narrow village lanes taking in the various points important to the village's history. Finish the visit at the café on the vast square dominated by the church. Then it's a 5 mins car journey to the Farmhouse. 6pm - Back at the farmhouse for a swim and freshen up before dinner. 7pm - Choose one of the excellent local restaurants from our list and enjoy. Total bike time for the day (approx) : 1h 45 to 3 hours of hard Tour de France cycling! "Only an avid local cyclist could have pulled together the varied routes that Neil has put together - they showcased the natural beauty and culture of Provence. It didn’t matter if we biked his short or long routes, my wife and I felt like we really experienced Provence – its agriculture, geology, and ancient hilltop villages." 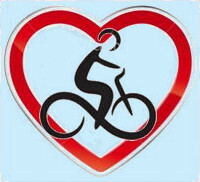 Diane & George - US - July 18 - Cycling in Provence review. "I'm not a cyclist, but my husband is, so when I booked this trip I knew I'd have to make a commitment outside my comfort zone. However, we BOTH had a great week. It was the perfect combination of cycling and sightseeing. Neil has carefully planned out all possible routes -- some challenging, some more relaxing -- and there are many, many choices. Every morning at breakfast, he reviews with you what you've chosen; his local knowledge is incredible and he offers recommendations ranging from quick stops to lunch spots to photo ops on each route." Gail - US - Sept 17 - Cycling in Provence review. "Neil has cycling routes to accommodate all abilities, taking in the picturesque Luberon countryside and the pretty villages. It is a great way to see this area of Provence. I can highly recommend staying here. We had a lovely vacation." Mairi - Saudi - May 16 - Cycling in Provence review. "Neil's encyclopedic knowledge of the Luberon region and the ingeniious use of Garmin devices allow cyclists of all ability levels to enjoy the beautiful French countryside and villages at their own pace. " Mike and Laurel - US - May 15 - Cycling in Provence review. "here were plenty of cycling routes to choose from, we are not very experienced cyclists so it was great to be able to choose how much cycling we wanted to do every day and how much time to spend in the beautiful old villages on the way. You could make it as relaxing or as challenging as you want! The area is stunning, Fontaine de Vaucluse and L'Isle sur la Sorgue were our favourite with the crystal clear rivers. 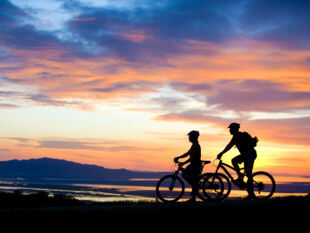 Most of the cycling trips are on quite countryside roads going through vineyards and lavender fields." Magda - UK - July 14 - Cycling in Provence review. "We have wanted to explore Provence more and found this fabulous bed and breakfast with self guided biking excursions that we could tailor to meet our abilities." Deb - US - June 13 - Cycling in Provence review. "Neil works hard to fit you with bikes and GPS routes appropriate for your abilities; whether beginner or seasoned cyclist. He provides pocket guides on recommended sights and restaurants along the route. Neil created a couple of special routes for us, and we never once felt lost or uncomfortable with the surroundings. It's also very comforting to know that a friend with a car is just a phone call away should you need help." Courtney - US - Sept 12 - Cycling in Provence review. "Cycling through the Luberon valley after having breakfast under the grape vines, going to an idyllic village to have lunch and knowing that Neil was preparing a feast for dinner was only a part of the experience." Kim & Annemarie - Australia - May 11 - Cycling in Provence review. Donna - US - June 2010 - Cycling in Provence review. Click HERE to read more about our Bikes & Equipment.